On Thursday, December 6th at 7:30 PM, please join us for a Christmas Concert held here at the Co-Cathedral. Currents News Anchor, Liz Faublas will be hosting and the concert will feature Emmy Award Winning Journalist and recording artist Kelly Wright. There will also be appearances by City of Churches Host, Anthony Mangano and 14 year-old Diana Marie Paunetto. Doors open at 7 PM, the concert is open to the public, no RSVP is required. We hope to see you there! All are welcomed to the Co-Cathedral of St. Joseph on Sunday, November 25th at 4:00 PM for Solemn Vespers for the Feast of Christ the King. Voices of St. Joseph Choir, under the direction of Alejandro Zuleta, will sing Gregorian Chant Vespers with Magnificat by Tomas Luis de Victoria. O Salutaris Hostia by Charles Gounod and Karl Jenkins’ Benedictus from The Armed Man as the choral recessional. Changes in the spiritual practices among the faithful, a decrease in available clergy and men and women in consecrated life, changes in the general population within our Diocese, as well as concerns regarding temporal matters have affected the means by which the Gospel of Jesus Christ has been proclaimed within the Diocese of Brooklyn. In an effort to respond in the best possible way to the gifts of the Holy Spirit generously given to us in our current situation, I have overseen a comprehensive pastoral plan, which included the whole of the Diocese of Brooklyn. In an effort to evangelize more effectively the community in Brooklyn, as well to administrate the temporal goods of the faithful more efficiently, Reverend Monsignor Kieran E. Harrington, Pastor of the Co-Cathedral of Saint Joseph, located at 856 Pacific Street, Brooklyn, New York 11238, and Administrator of Saint Teresa of Avila, located at 563 Sterling Place, Brooklyn, New York 1123 8, petitioned that they be canonically merged. In keeping with the requirements of the Universal Law of the Church, the Presbyteral Council was consulted on September 25, 2018 (Canon 515 § 2), and after having heard the reasons for the proposed merger its members expressed their support for this action. 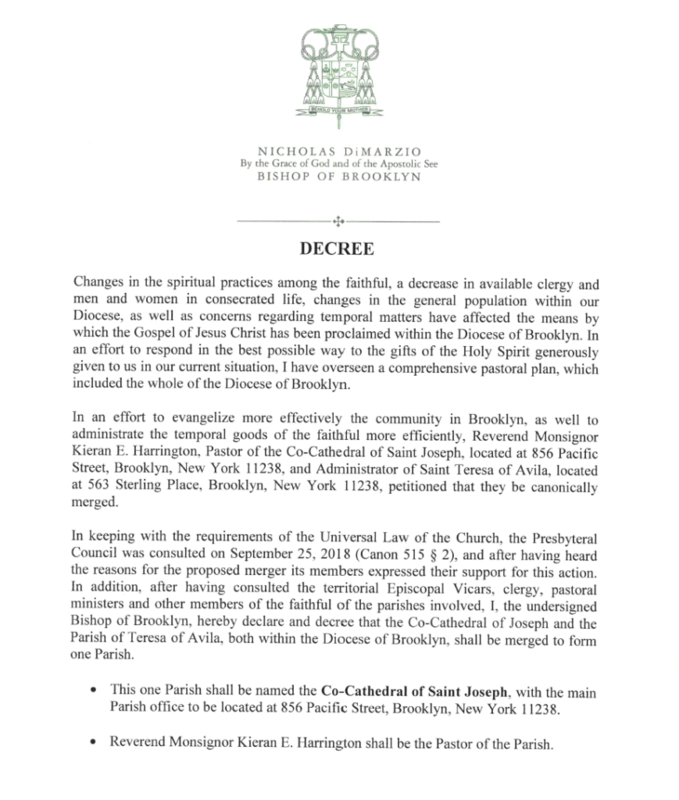 In addition, after having consulted the territorial Episcopal Vicars, clergy, pastoral ministers and other members of the faithful of the parishes involved, I, the undersigned Bishop of Brooklyn, hereby declare and decree that the Co-Cathedral of Joseph and the Parish of Teresa of Avila, both within the Diocese of Brooklyn, shall be merged to form one Parish. • This one Parish shall be named the Co-Cathedral of Saint Joseph, with the main Parish office to be located at 856 Pacific Street, Brooklyn, New York 11238. • Reverend Monsignor Kieran E. Harrington shall be the Pastor of the Parish. • The territorial boundaries of the new parish shall encompass all of the territory which, up until now, has constituted the territories of the Co-Cathedral of Saint Joseph and Saint Teresa of Avila. • All assets and obligations currently belonging to aforementioned parishes are by this canonical merger, transferred to the Parish of the Co-Cathedral of Saint Joseph – Saint Teresa of Avila. • The parochial registers and the seals of the aforementioned parishes shall be kept at 856 Pacific Street, Brooklyn, New York 11238. • The Parish shall have two churches for worship: The Church of the Co-Cathedral of Saint Joseph and the Church of Saint Teresa of Avila. This merger shall take effect on November 1, 2018, at which time the public juridic persons of the Co-Cathedral of Saint Joseph – Saint Teresa of Avila shall be merged. Recourse action may be sought according to the norms of Canons 1732 to 1739 of the 1983 Code of Canon Law. Where am I in the batting order of my church? Join us for prayer, music and an open discussion led by guest speaker Monsignor Kieran Harrington. Register before August 4th and email Mother Maria Amador. The event will be held at Coney Island Beach next to the baseball field. * We will meet at 5:30 PM by the Jackie Robinson Statue in Coney Island. We look forward to seeing you for Holy Week. Our doors are always open. Join us this Sunday, March 18th, at noon as we celebrate Mass in honor of Fr. Charles P. Keeney’s 40th Anniversary of his Ordination to the Priesthood. All are welcome!